This Palo Alto, CA front yard was designed be a point of interest for anyone passing by. Landscape designer Chris Jacobson () kept mostly to a green palette to create tranquility and year-round good looks. Clumping Berkeley sedge dots the yard, while spiraled Aloe polyphylla and asparagus ferns line the drive. Japanese maples and dogwoods provide softness, shade, and color. Jacobson placed an arbor supported by concrete columns seven feet from the house, creating a courtyard. 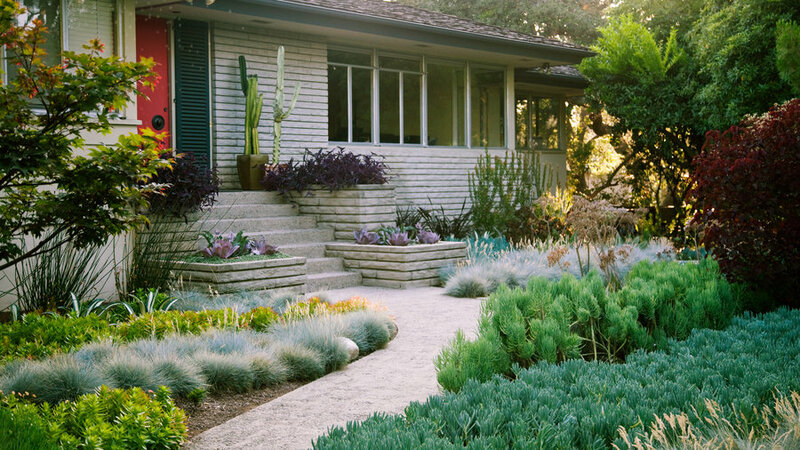 The planting beds, mulched with tumbled glass in shades of blue and green and buff-colored decomposed granite, add texture while keeping the palette serene. Plants may be a new medium for interior designer Diane Lam, but she has years of experience with combining textures and colors. So when she and her husband, David Omori, decided to replace the grass and ivy in their front yard, her love of texture and color guided the design. Working with landscape designer Darren Shirai and landscape architect Jeremy Taylor, Lam organized unthirsty groundcovers into bands that cross the yard like giant stripes on a rug. All told, the bands feature six kinds of succulents, three kinds of shrubs, and one kind of grass. “It’s a kaleidoscope of changing colors,” Lam says. The plants get watered weekly using a drip-irrigation system and need little trimming. And Lam actually relishes the maintenance that comes with easy-to-propagate succulents. When one of the plants grows too big for a space, she pulls it out and restarts snippets elsewhere in the garden—or pots it up to give as a gift. 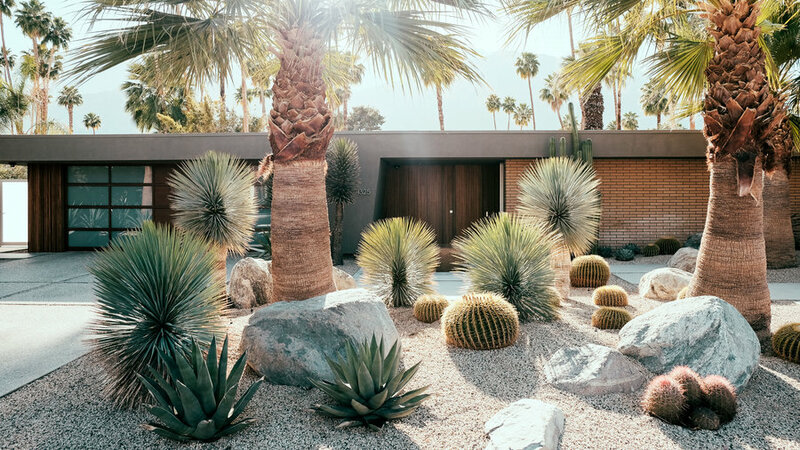 In the pictured front yard, the sturdy trunks of California fan palm (Washingtonia filifera) anchor the space, designed by Marcello Villano. 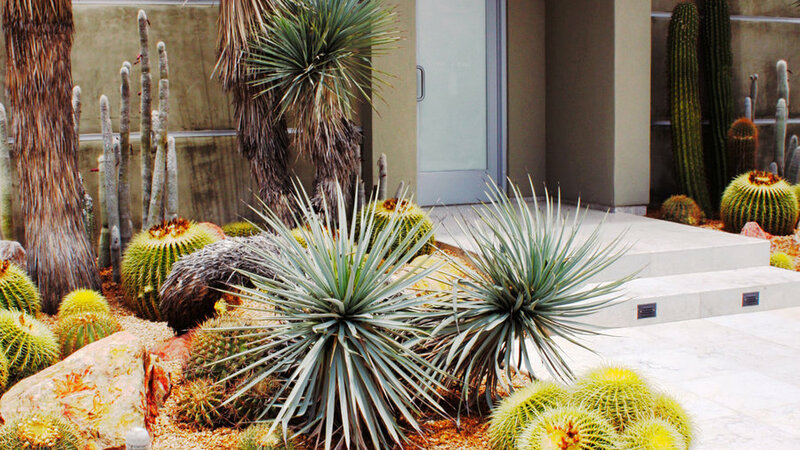 The landscape is studded with Agave ‘Sharkskin’, feathery Yucca rostrata, and golden barrel cactus. The tall Mexican fan palms, Washingtonia robusta, were preexisting on the property. 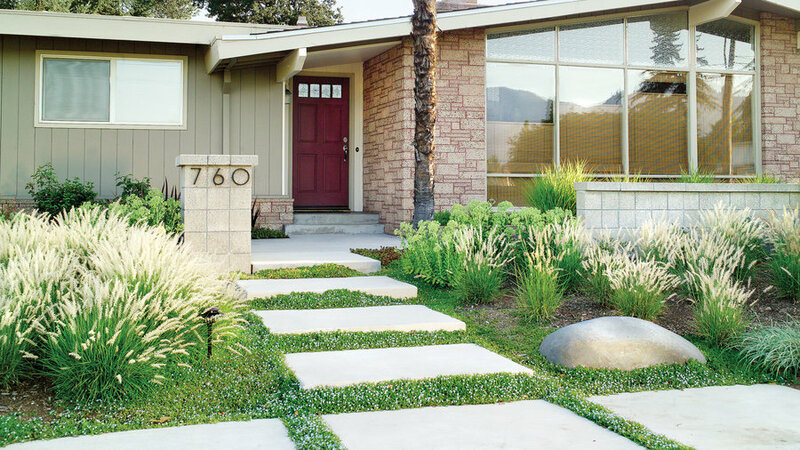 While it feels like you might be checking into a fancy resort, the truth is that this front yard (designed by Brooke Dietrich, ) requires a lot less maintenance and irrigation than a plain old patch of lawn. 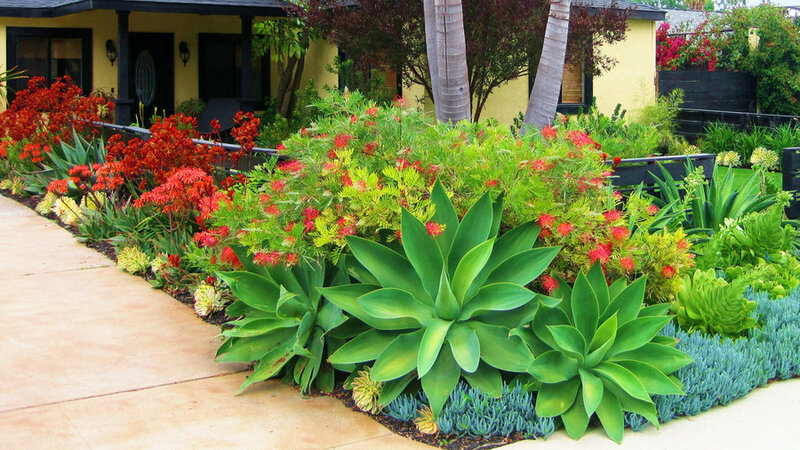 Bold succulents—agaves, aloes, and aeonium—give this front garden a tropical look without heavy water requirements. 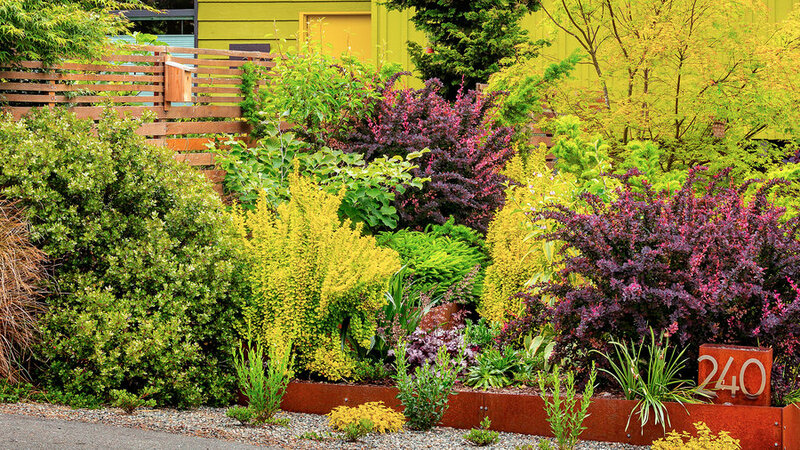 Hot-colored flowers—coral aloe, chartreuse euphorbia, lipstick pink grevillea, and kangaroo paws—add punch to the outer garden, while a judicious splash of blue Senecio mandraliscae tones down the heat. 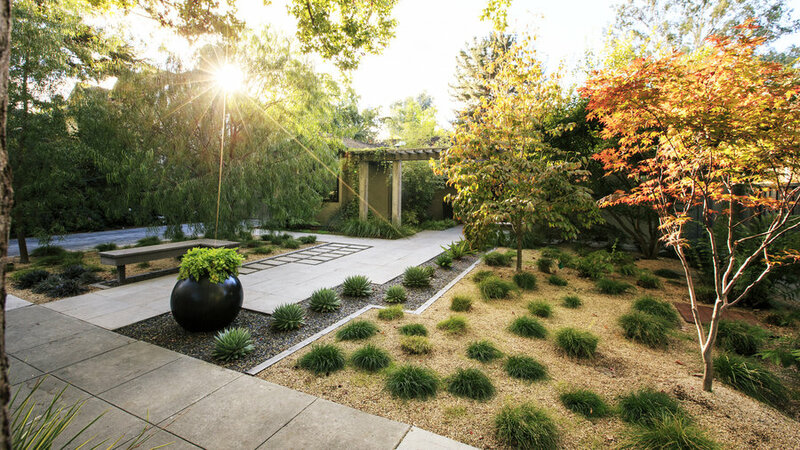 Seen from the street, this ornamental grass-filled garden (designed and built by Rebecca Sams and Buell Steelman, ) catches light and moves with the wind. And if you’re lucky enough to be invited in, the approach to the front door is a full on urban hike. From fluffy mounds to floppy giants: Rusty-hued Carex testacea softens the front path, while green kniphofia, plum Heuchera ‘Obsidian’, Libertia peregrinans ‘Bronze Sword’, and euphorbia surround the ‘Karl Foerster’ grass. Across the path, drifts of Picea sitchensis ‘Papoose’, variegated iris, and Phormium ‘Dusky Chief’ encircle a ginkgo tree. 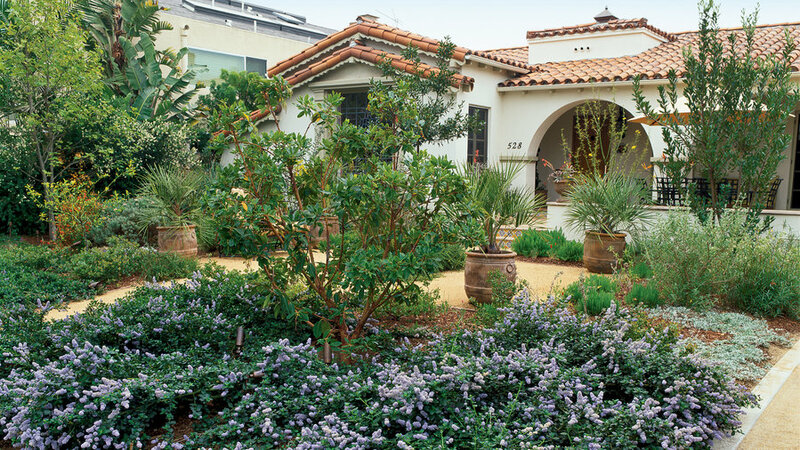 This Santa Monica, CA front yard (designed by Stephanie Blanc) packs quite a sustainable punch. California native 'Yankee Point' Ceanothus, favored for its compact habit, sturdy nature, and blue flowers, hugs a corner of the front yard, offering a cheery greeting for any passerby. Since most California natives bloom in spring, combine them with plants that flower at other times, including butterfly weed (Asclepias tuberosa), coral fountain (Russelia equisetiformis), and Mexican lobelia (Lobelia laxiflora) for summer color. Be sure to round out sustainable design with permeable paving. It helps rainfall percolate easily into the soil. While Zach Galbraith was busy unpacking boxes after moving into a Burien, Washington, house in 2006, wife Manda () was outside planning the garden. At the time, it was covered in invasive blackberry brambles, English ivy, and weed-laden grass. “I wanted something bright,” Manda says, “something alive with color.” At the nursery, she reached for plants with lime or purple foliage, drawn to the way the complementary colors pop. The lime green home forms a backdrop for plants in greens, yellows, and purples. They include reddish purple ‘Rose Glow’ and ‘Sunsation’ barberries; Hinoki cypress; Monterey manzanita; orange sedge; low, variegated ‘Mickie’ rockrose; and witch hazel. 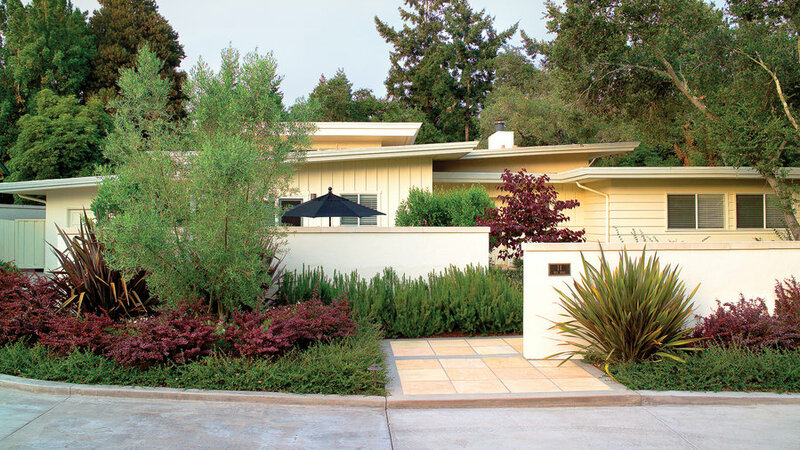 The original front yard of this Santa Cruz residence was dominated by an asphalt driveway, gravel parking area, and two large trees. Except for car parking, it was an unused space. In an effort to increase curb appeal, in went a pair of six-foot-tall concrete walls that now enclose the front yard shelter and outdoor dining area. The dining alcove was placed here because this spot is west-facing, and warm and sunny is a good thing in the home's chilly, coastal climate. 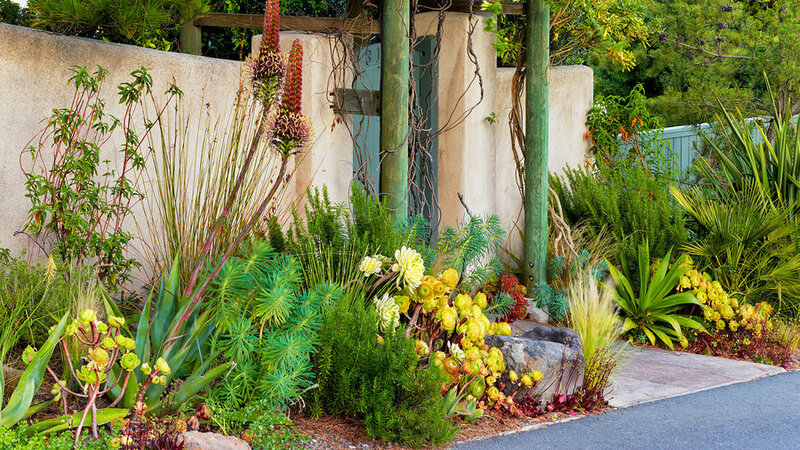 The staggered walls provide room for generous planting pockets for green and burgundy foliage plants. The look is a win/win—homeowners gain an al fresco dining room, while neighbors gaze at a gorgeous garden. 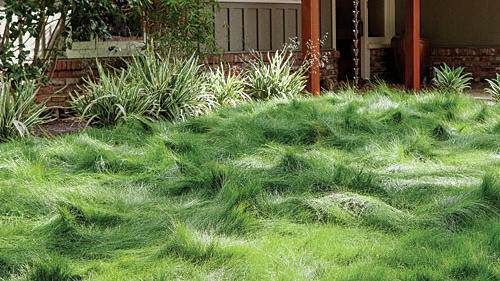 Doppelgänger to a wind-tossed sea, this fescue lawn (designed by Sherry Johnson and Linda King, ) gets less water, much less mowing, and way more attention than conventional turf. The owners describe it as “very simple, very dramatic.” Passersby agree—somebody knocks on the door every couple of months asking what it is. The answer: Eco-Lawn, a blend of a half dozen fescues that grows well in sun and shade, and never gets much above ankle height. Planted from seed, the lawn is rejuvenated with one or two annual mowings, and watered with extra-tall popup sprinklers. Their owners’ only one regret is that they didn’t put it out back too. 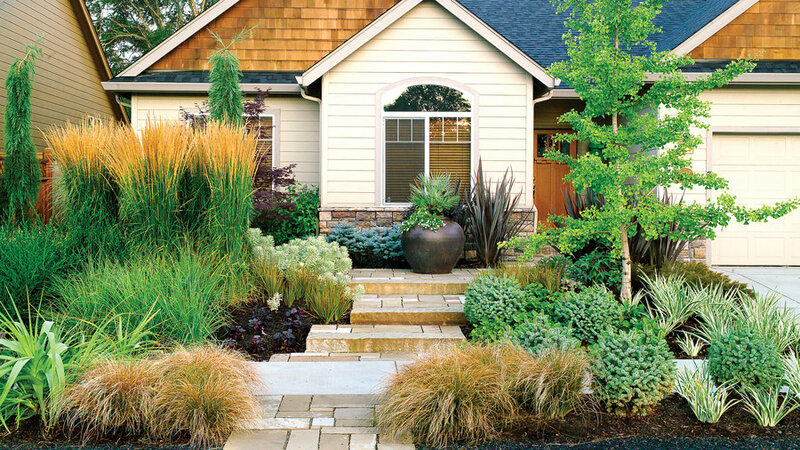 With just a few choice plants, this front yard (designed by Jim Love, Galbraith and Associates)​​​​​​ has significantly more appeal than a boring lawn. A variety of heat-tolerant plants with low water requirements provide year-round interest. But the real stars of this yard are the oversized pavers surrounded by a creeping groundcover. Pavers take up most of the space where thirsty grass might grow instead, creating a striking pattern while also helping save resources and money in the long run. Guests have nice, wide pavers to use on their approach to the front door. And should their feet slip a little—no problem—the creeping thyme handles some foot traffic without a problem. Taking advantage of a relatively small planting pocket, say, on the exterior of a fence, can have huge benefits for a home’s curb appeal. Here, a buff-colored stucco wall and painted wooden gate define the entry to this Northern California home, while providing plenty of privacy for the homeowners. The wall offers more than privacy, though—it’s the perfect backdrop for a warm mix of water-wise Mediterranean plants including: Euphorbia characias, upright rosemary (Rosmarinus officinalis ‘Tuscan blue’ ), and Aeonium ‘Catlin’s hybrid’ and ‘Sunburst’. A wood arbor climbing with white passion vine (Passiflora) adds height and substance to the passageway.